Choose from: Exact p values, Monte Carlo p values, Pearson Chi-square test, Linear-by-linear association test, Contingency coefficient. Uncertainty coefficient (symmetric or asymmetric), Wilcoxon signed-rank test, Cochran’s Q test and Binomial test. Because it is part of the IBM SPSS Statistics product line, you can count on comprehensive solutions for your modeling and data analysis needs. 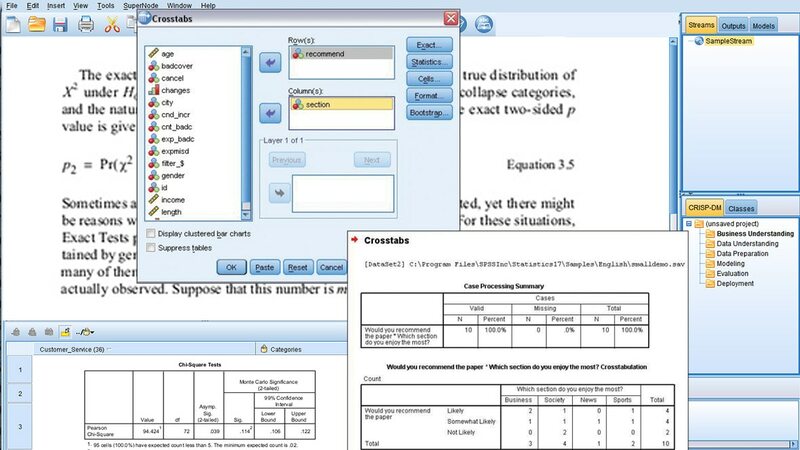 You will find SPSS Exact Tests particularly useful if you perform data mining or database analysis for direct marketing research, survey research, medical research, biostatistics, social science research, or to conduct any type of experiment. There is no steep learning curve because you don’t need to learn any new statistical theories or procedures. You simply interpret the exact tests results the same way you already interpret the results in IBM SPSS Statistics. Help ensure correct results if you have a small number of case variables with a high percentage of responses in one category or have to subset your data into fine breakdowns. IBM SPSS Exact Tests requires a valid IBM SPSS Statistics Base license.